Rhiannion Marshall, set to make her Castleford Tigers Women debut. Castleford Tigers Women will take on York City Knights Ladies in their first game of 2019. The pre-season friendly will take place on Sunday, at noon. The game will be played on Haxby Road, in York, the same ground which saw the Tigresses pick up an impressive 62-0 win against the Knights in the opening game of the 2018 season. Head coach Lindsay Anfield is looking forward to the clash. Anfield admitted she was happy with progress that her side have made in pre-season and is particularly impressed with how the two new signings have integrated into the team. She added: “We were disappointed with how last season finished in going out to Leeds. It was only a matter of days before the players were asking for programmes to do in the off season. Some of them have hit it really hard which is good. 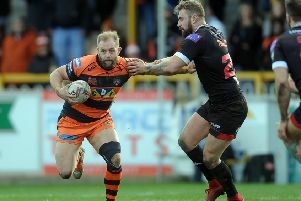 Rhiannion Marshall, who recently signed for the Tigers from Leeds, is also excited for the friendly saying: “I’m looking forward to putting on the Tigers shirt for the very first time. We’ve been working hard in pre-season so it will be good to finally get on to the field.